For the little's first birthday, we decided to make items to put in the goodie bags. Rather than having more "stuff", I thought, "Who doesn't love playdough and bath bombs??" I used this recipe from The Humbled Homemaker. 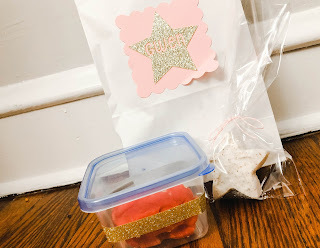 These ingredients I ordered (several batches of the recipe) made over 20 goodie bags and we had at least 20 leftover. And there were still leftover ingredients for most of them. I did not use any essential oils because I wanted these to be safe for babies and children of all ages. Additionally, because I was giving to many families, I did not want to worry about sensitivities or reactions. When I make them again for my own children, I may add some child safe oils at a 1% dilution (10 drops of EO in this recipe would be 1%). I bought a silicone star mold to go with the bithday theme, however, I would not use a silicone mold again. Because the silicone has "give" it was difficult to pack the molds tightly enough without overstuffing them and changing the shape. I recently bought these molds for making again soon!